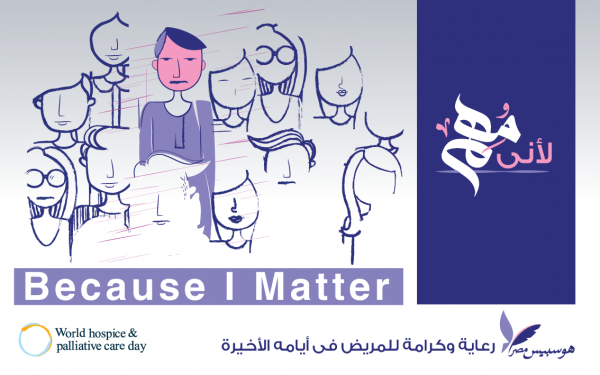 Hospice Egypt "Because I Matter"
Every year, JOSAAB Foundation ‘s Hospice Egypt team celebrates the World Hospice Day with an objective to spread awareness about the free of charge hospice services provided to terminally-ill patients in Egypt. The Hospice Egypt is a unique project attempting to cross cultural and religious barriers in their line of work, as hospice does not have an Arabic translation and talking about death may be misunderstood as a bad omen. This event was held on Wednesday the 31st of October 2018 at the cultural and historical building "Bayt Al Sinnari" from 6 - 9 pm under the theme "Because I Matter". The program of the day included both educational and musical segments. The educational part included a talk by the renounced psychologist Dr. May El Rakhawy, who spoke about how to support caregivers and the children of terminally-ill patients. We were honored by the words received from two internationally-known contributors and leaders of hospice and palliative care: Dr. Stephen Connor (Executive Director of the Worldwide Hospice Palliative Care Alliance) and Dr. Erich Rösch (Managing Director of the Bavarian Hospice and Palliative Care Association). The musical segment included two performers, a young band that played oriental music and the exceptional Egyptian singer Maryem Nouh. The attendees included Hospice Egypt staff members, medical doctors, hospice nurses, hospice volunteers, community leaders, family members of terminally-ill patients and public audience. Some volunteers and family members shared their stories and experiences as caregivers of terminally-ill patients.